Get 50% off full-price styles and an extra 40% off sale styles at LOFT. Use the code LUCKY50. Lou & Grey exclusions apply. Valid online only. Sale ends 11/17 at 10AM ET. 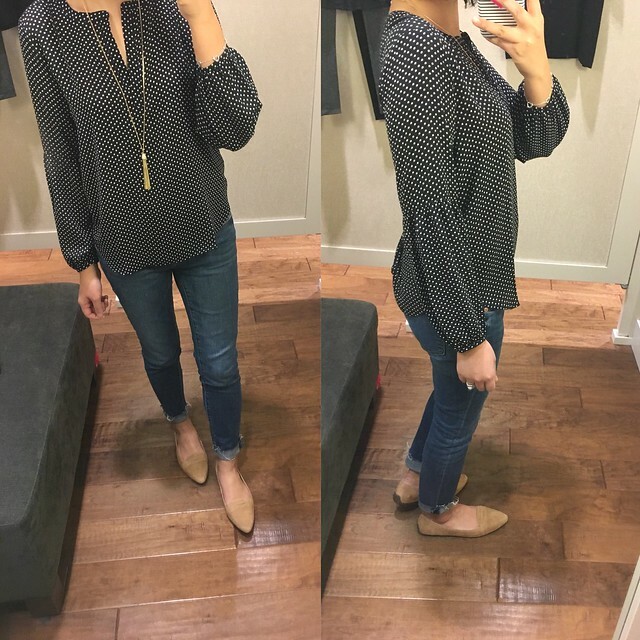 I don’t know how I missed this top (also available in a cute blossom print and solid color here) until now but I came across this lantern sleeve blouse while shopping with my mom. Size XSP fits me true to size. I found the sleeves just a tad short since my arms are a bit longer but it should hit at a good length for most petites. I like that the gathered sleeves are not too tight across my wrists. The v-neck is a bit low for my taste so I will wear it with a layering cami. Note that the back of this shirt is rayon while the front is polyester so I hope it washes well. Update 11/17: This blouse washed well in the cold wash and air dried. 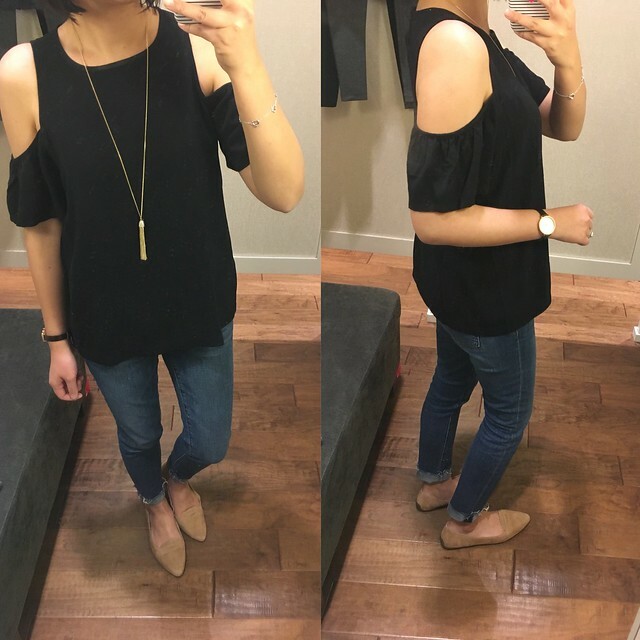 I’ve been on a mission to find a cold shoulder top that covers my bra straps so I was delighted when Su shared this new arrival with me. 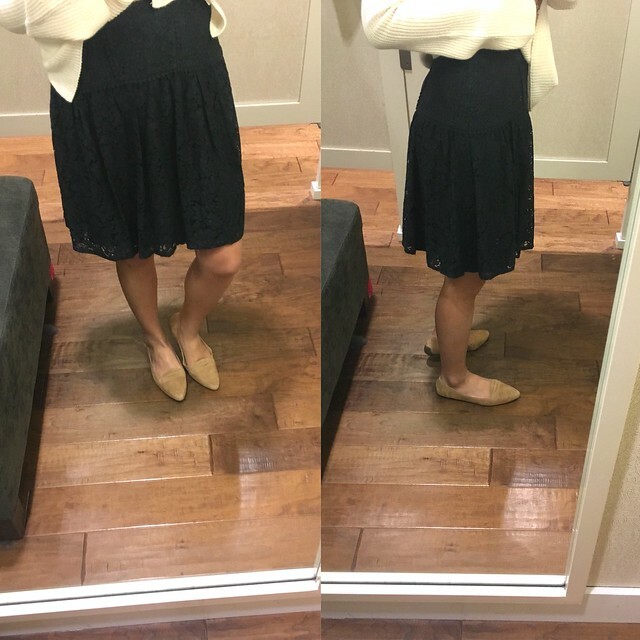 I had previously tried on size S regular but size XS regular fits me better. It is 100% viscose and I’m not familiar with this fabric but I hope it will wash well. 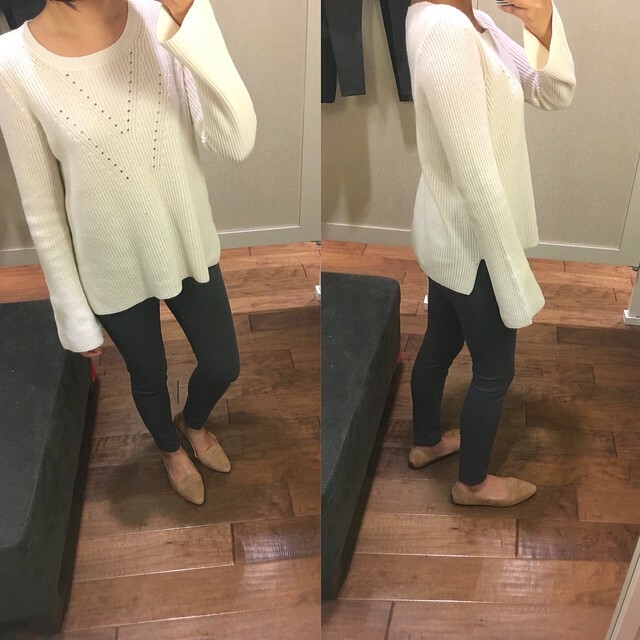 I tried on this bell sleeve sweater again since I found size XS regular. It fit me better than size S which I reviewed here except the bell sleeves are still really long and in the way. The excess sleeves/material would look ridiculous sticking out of my winter coats so I passed on it for now. If you plan to wear it with sleeveless vests then that would be a better layering option. I like the overall length of the regular missy size so I’m not inclined to try it in petites unless I find it in stores. 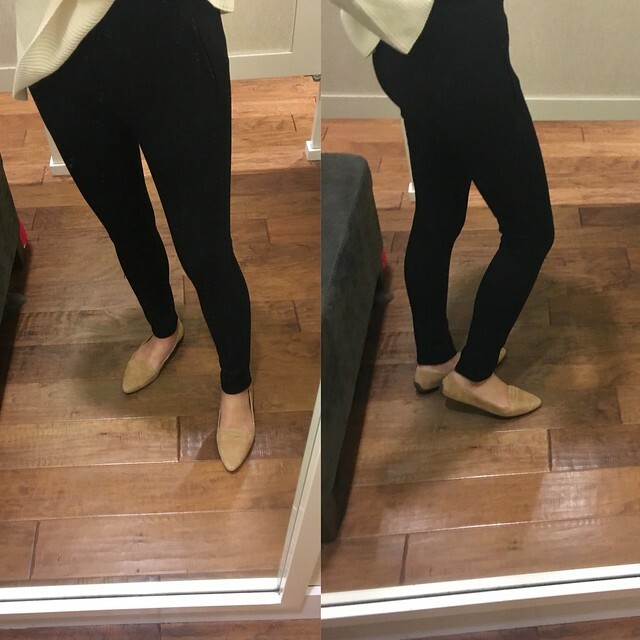 I finally tried on size 27/4P of these soft sateen leggings and I fell in love. These run two sizes smaller for me since I normally wear size 25/0P in most loft jeans and size 26/2P (reviewed here) was still too tight. I got the cool steel grey color and I also just ordered the whisper white color. FYI. You can check out all my recent purchases here. I saw the cute raw hems on these skinny jeans and I’m glad I tried them on because they’re the perfect ankle length jeans. The medium original enzyme wash is a gorgeous medium wash. I’d say these fit true to your usual LOFT sizing for pants. 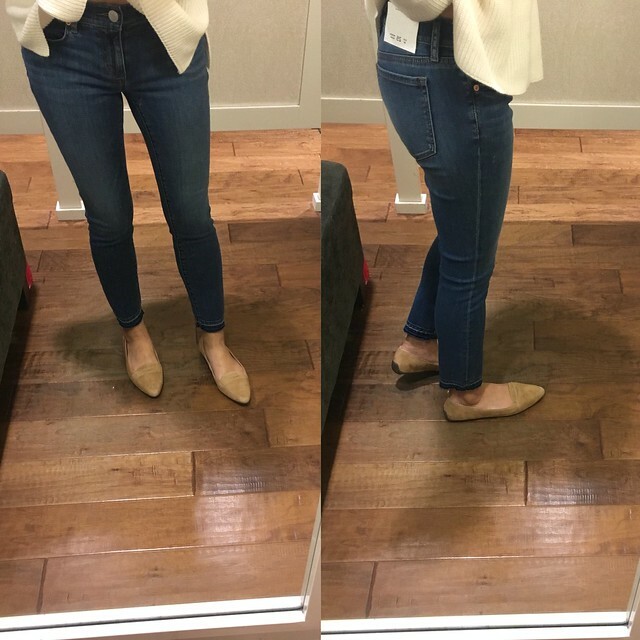 For an alternative sizing reference, the waist of these jeans measure 28″ across the top of the waist band. 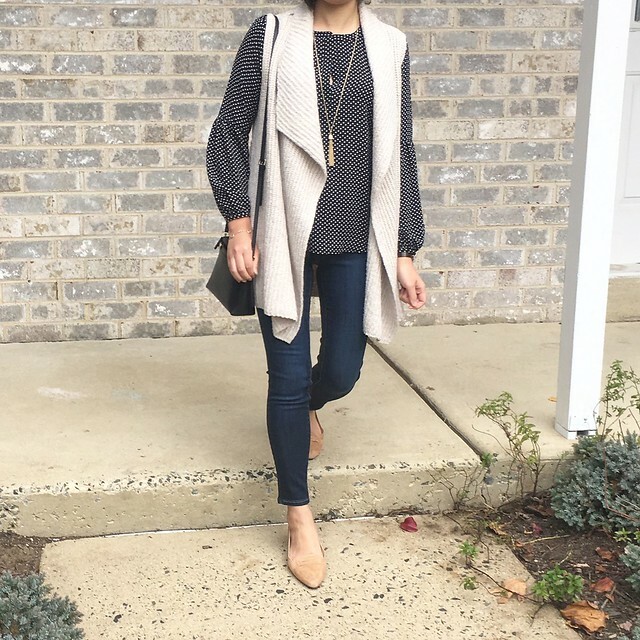 These modern skinny jeans are similar to a past season favorite but I found the ankle opening to be less narrow than the pair I favor (last seen here). I really wish they would bring back these denim leggings in black. 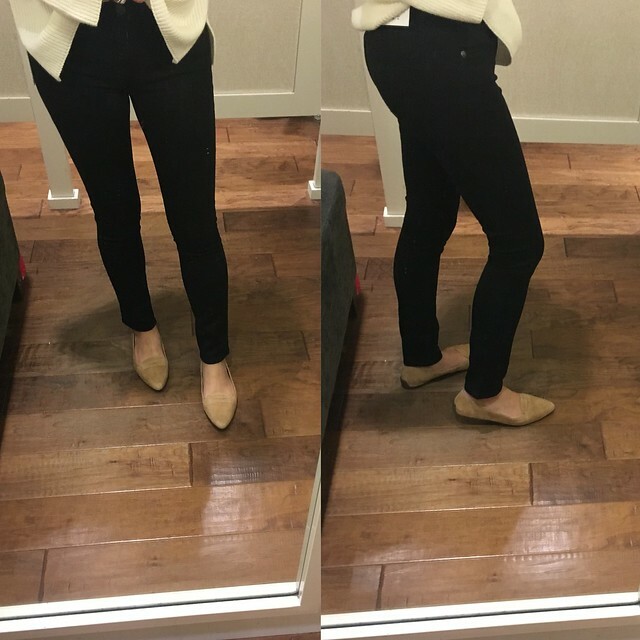 I also tried on these knit zip pocket pants but I didn’t really like how they felt as I pulled them up. They feel like really thick leggings but they look like dress pants and the inseam is just a bit longer than I prefer. The ankle opening also isn’t as narrow. Lastly, these don’t do anything to lift your behind unlike their regular denim. Unless you have a gravity defying rear you may not like how these look from the back. I happened to check the final sale rack at this store and came across this pretty hunter green lace skirt in size 00 regular. It was a perfect fit on me so it came home with me for less than $12! I rarely wear skirts anymore but I hope I can find an occasion to style and wear it this holiday season.